Seymour Locksmiths is an independent business with over 5 years of experience, providing dependable and professional locksmith services in Portslade and the surrounding area. Whether you need your door locks upgraded, a broken window key fixed or locksmith services for a business property, we have a varied selection of lock and security-related services to choose from to suit both residential and commercial clients. We take pride in delivering a high standard of work to all of our clients and always provide a great service to each and every one of our customers. Our expertise in lock repairs and installations can be applied to domestic and commercial properties, and we strive to provide excellent value for money for all our clients in the Portslade area. Day or night, we’ll be on hand to help you with any lock-related issue you may have. From small tasks like replacing a window lock to emergency repairs that are required as soon as possible, we offer a host of different locksmith services in the Portslade area. We use insurance-approved locks for complete peace of mind and a high-quality service that ensures your home is secure before we leave any job. Our trained and experienced locksmiths deliver a trust-worthy service every time, guaranteeing excellent workmanship that you can rely on. If you have any questions about the services we provide or you’d like a quote for a job you have in mind, you can contact us using the form on the right or give us a call on 01273 465336 so we can help you with your enquiry. Need an Emergency Portslade Locksmith? Sometimes the worst happens, and you find yourself in a crisis where you’re locked in or out of your home, without your keys or the unfortunate victim of a break-in. In those circumstances, it’s crucial that you have a service you can rely on to be efficient and fast. That’s where Seymour Locksmiths can help. Our quick response rate and 24/7 service means we are on standby at all times to answer your emergency calls, day or night. Our skilled locksmiths can provide you with a quote over the phone so there are no unexpected costs to worry about and we aim to provide you with a quick resolution to your situation, using non-destructive methods that will allow you to gain entry to your home without unsightly damage. 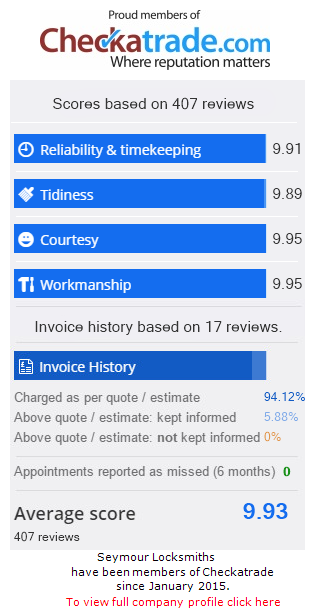 We are Checkatrade-approved and strive to be with you within 20 minutes, day or night. Your security is of paramount importance – no-one wants to feel at risk in their own home. So, whether it’s a broken lock, a replacement system to keep the contents of your garage secure or an upgrade in your locking system for added security, we can help you with any repair or replacement you’re in need of to ensure you feel as safe as possible in your property. At Seymour Locksmiths, we carry a variety of British Kitemark-certified locks and provide a 12 month guarantee on all of the work we carry out. By having a wide selection of locks to choose from, we can complete each job in one visit for immediate security and no need for additional charges. We also take a professional approach to every task we complete – we’ll never sell you anything you don’t need and take care to complete every job as efficiently and quickly as possible. Whether it’s a residential property or commercial premises, we ensure a reliable service on all repairs and lock upgrades in the Portslade area. Our locksmith services are available for Portslade clients, 24 hours a day, seven days a week. There’s no call-out charge and we always aim to be at your property within 20 minutes where we can. We cover all BN41 postcodes, as well as the surrounding area.